I will be standing for Mayor of Hamilton city in the 2016 elections. I have been a Hamilton City Councillor for the last three years. During that time I have endeavoured to consistently support the making of wise decisions and investments that will help our city grow and continue to be a great place to raise families, operate businesses and live. Hamilton needs a mayor who is not afraid to stand up for truth and fight for what is right for our city. I am committed to do that. 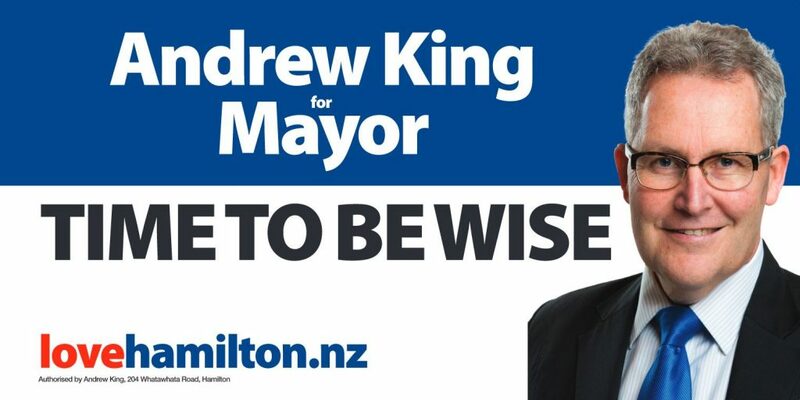 My vision for Hamilton is firstly truth from the political wing in partnership with the Chief Executive. My second priority is investing in infrastructure to make sections available to grow our city and rates base. With new communities we need amenities. That’s what makes Hamilton city a place to be proud of and a great place to live. I also support reducing red tape. We have a new District Plan which is the most restrictive plan in the history of our city. We need to go through this plan and get rid of some of the rules to make it easier to do business. I Say “No” to Water Meters for Hamilton City. “User pays” sounds good, but the cost to be fair to everyone and measure water used outweighs the financial benefit to the community overall. For instance, if the estimated cost to install, maintain, replace, read, invoice and collect debts is $100 per year and Hamilton has 55,000 residential connections that would result in a $5.5m cost to property owners at $100 each. The proposed Council Controlled Organisation is expected to save $5m per year. So the overall cost to the community for water meters is greater than the expected benefit. You can find out more about what I stand for here. As well as running for Mayor I will be standing for the West Ward as a Councillor. Thank you for helping me govern our city.